How Smart is the Smart Lift? The Smartlift™ facial surgery procedure is the latest trademarked surgery marketed directly to the patient as an answer to facial aging problems. The Smartlift™ procedure differs significantly from the copyrighted or trademarked procedures in that the so-called Lifestyle Lift® is based on the aggressive marketing of a procedure (the Lifestyle Lift®) which only distinguishes itself by its simplicity leading to certain claims of reduced recovery and reduced operative times leading in some way to superior results. The Smartlift™ is different in that the sales pitch has to do with technology rather than the marketing of a procedure. The Smartlift™ is the facial rejuvenation procedure performed with the Cynosure® laser used for the laser assisted Smartlipo® procedure. While the use of the Cynosure MPX® laser is accepted for liposuction, it is less accepted in the face and may be contra indicated when used to liquefy facial fat. The Smartlift™ is the use of a laser underneath the surface of the skin (internally) as opposed to other laser platforms used on the surface of the skin (externally) resurfacing for fine lines and wrinkles. The premise behind using a laser as an adjunct for facial rejuvenation is that due to the heat generated by the laser, facial skin contracts causing some small amount of skin tightening. At the same time, the skin is heated and the laser emulsifies the facial fatty tissue violating the premise that you shouldn’t remove fat from the aging cheek. The Smartlift™ is the procedure using the laser as described above to effect facial skin tightening with no actual surgical lifting performed. Even with the addition of CO₂ fractionated laser to the external surface of the skin, the actual skin tightening is minimal. With the aggressive attempt to tighten the facial skin by internal heating one runs the very real risk of removing facial fat excessively leading to a fairly dramatic skin laxity and worsening of the facial aging signs as well as severe skin contour deformities. The patient above is a 65-year-old woman 11 months after having the so-called Smartlift™ facial procedure on her sagging neck and aged jaw-line. Additionally, she had upper and lower blepharoplasty. She related her request for improvement in her aging face, neck, and eyelids after the Smartlift™ laser procedure. The first challenge was to re-drape the skin of the neck which was no small feat due to effects of the laser on the submental fat and skin. The jaw-line, cheeks, marionette lines, and nasolabial folds were addressed with a midface lift. The cheeks were blended with the lower lids and the upper lids re-done. Fat was liposuctioned from her abdomen, processed and enhanced with her stem cells to be injected in her nasolabial folds, lips, chin, and marionette lines. Her neck continues to be a problem and has required several steroid injections to help soften the scarring caused by the Smartlift™ lift. It has come to my attention that the Cynosure Corporation through its marketing people are now touting several other procedures based on the Smartlipo® laser with the addition of incisions in the mini-lift pattern as well as the full facelift incision pattern. Succumbing to the philosophy that all of these procedures deserve a trademarked name, i.e. the mini-lift plus laser is the “Ultra mini-lift™,” the full facelift plus laser is the “Laser Smartlift™.” I was surprised that the “Ultra Mini Smartlift” was kept out of the marketing “lift” bonanza. 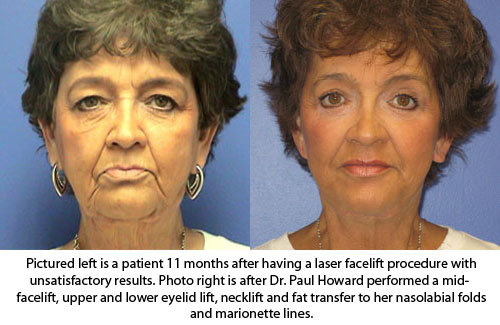 Read more about Dr. Paul Howard and his popular Howard Lift Facelift in Birmingham, Alabama.